Live and breathe tango for one-day, one-week or more! 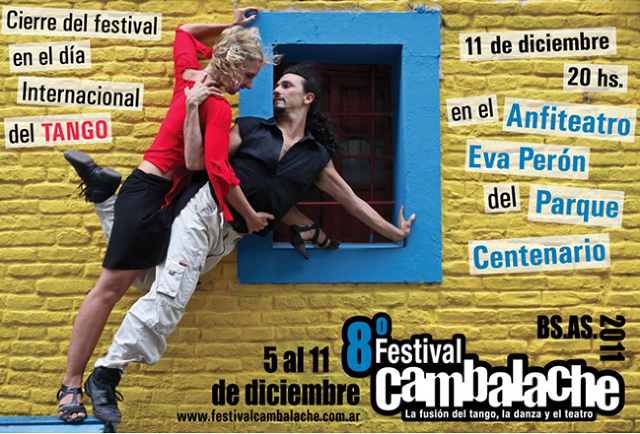 December 5th marks the beginning of the 8th annual Cambalache Festival, a seven day extravaganza dedicated to the fusion of tango, theater, and dance. The non-profit festival is dedicated to celebrating, promoting and advancing not only tango, but the fusion of tango with other art forms, including film and other dance styles. There will be music and dance performances, lectures on tango and its evolution, film screenings and much more. Come out to enjoy some of the festival with Narrative Tango Tours! If you’re in town and want to enjoy the festival with some authentic Buenos Aires tango dancers let us know – we’ll organize everything and provide a guide. Fully detailed information can be found directly on Cambalache’s website, and our friends at 2xtango put together a fabulous bi-lingual, day to day outline of the complete program of events.